White kurties have always been in fashion and the lifesavers of many girls who wear traditional for the first time. When it comes to wearing kurtas, then many girls get confused what to wear. If you are new to try the traditional attire then simply choosing a white kurta design will help you. White is considered as pure and gives a pristine look as well. It is well suited for any occasion and can be worn as a casual outfit as well. There are plenty of white kurti styles, designs and patterns available that can be carried with poise and grace. Let’s find here with mentioned white kurta designs for female. The most praised plain white kurti designs are the designer ones. If you want to rock the attire, then you can choose from the designer range. These are well suited for high class parties and events where you want to be modest and fashionable as well. White has always been in fashion and with the high-class designs it makes the white kurti design more beautiful and elegant. Looking for a traditional avatar and yet want to be modern then this type of white colour kurti design with red pant is the one for you! Having white indo-western kurti sounds like a cool idea, you can have the best of both worlds. In this pattern you have something traditional and something western. These white kurtis for ladies are well suited for any occasions. Another stylish and modern white kurti pattern is the jacket pattern. 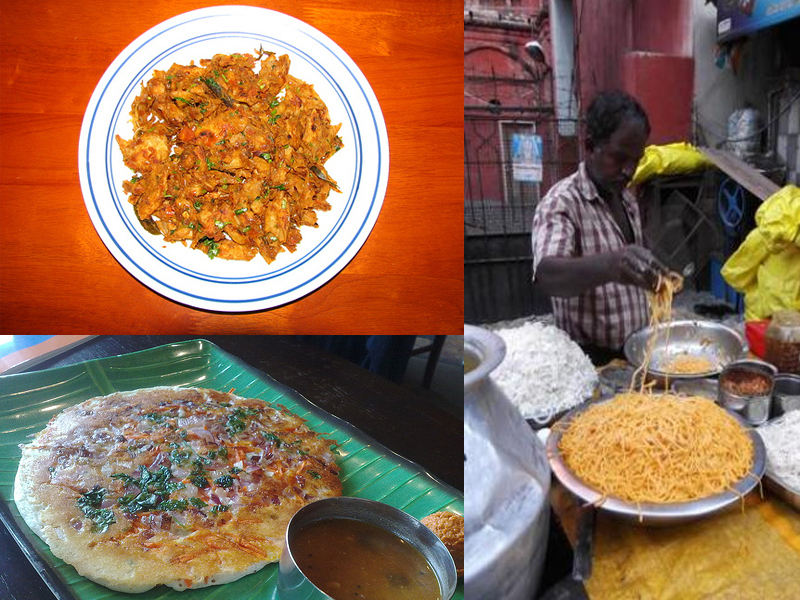 These are usually paired with dhotis. These look good at traditional events as well as functions. You can get the modern look with these kinds of jacket style kurties. Especially when it is white then you can try anything with it. It is a perfect party outfit which is elegant, classy and rocking at the same time. Another variety that you can get in kurtas is the fish cut kurta. This is a white long kurta which gives a classy look and can be worn by women of any age. This blue and white kurti is perfect for women with good height. It can be worn at offices as well. When looking for white kurti designs one must have a look in the embroidered section. You can get a classy white embroidered kurti. It gives a classy look. It is also worn by women and girls as well. The embroidery may be of different patterns and styles which may want you to consider keeping one kurta in your collection. Kurtas are not every girls choice and we know that. So if you wish to try the traditional look yet want to be stylish then you can surely try this modern kurta. This can be considered as a formal outfit as well. Style up for a party with this white kurti design and you will totally rock it. Trying to go a bit modern with kurta? You can surely go sleeveless! These kurtas look modern and bold, unlike the other kurtas. Sleeveless kurtas are very much in fashion and gives a cool look. This is well suited for girls who like fashionable clothes. It is smart and usually worn by the young generation. It can also be worn by women of any age. Another type in white kurta for girl is the red and white kurti. This style is unique and gives a very beautiful look to a girl. It is well suited for office as well as casual looks. Young women can wear this red and white kurti combination with confidence and be the complete girl they wish to be. 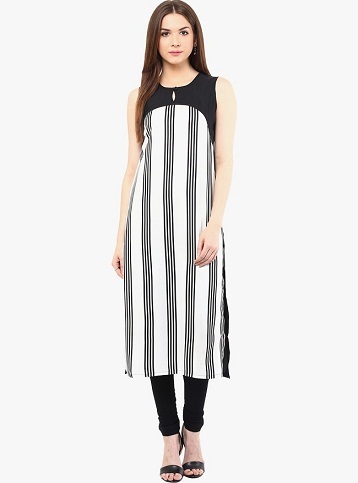 This off white kurta also come in various patterns, materials and styles. It can be worn along with scarves as well, pair it with a scarf to get the best look. Now there are the casual kurtas, which are simple and sober. These may be of various types they may have stand collars, square collars, round necks, etc. when you need a casual kurta then you can surely choose this one. These can also be worn at offices or as daily wear outfits. This casual kurti is the best outfit that can be worn. This is another type of white kurti for girl that is very much in fashion. Every girl wishes to have a chiffon kurta. And a white kurta for a girl should be chiffon. The chiffon kurta looks very elegant and classy to wear. It completes a girl’s look and can be worn at anywhere, any time. These white kurtas can be short or long, layered or simple non-layered. This looks good on women of any age, young girls and grown-up women can wear this kurta without any thoughts. The next plain white long kurti design with is a bit common is the Pakistani design. It looks sober when worn due to its long cuts and closed collar with long sleeves. It gives a professional look and when wearing a plain white kurta one must one miss out this pattern. This looks best if it is a white cotton kurta. It can be paired with jeans or long loose plazos. When wearing a white kurta, one must not forget about the traditional fulhari work. The embroidery is handmade and the finished look is just amazing. It can be worn at special occasions, events, parties, etc. the fulkari white kurta pattern gives a complete traditional look and is well suited for women who wish to symbolize modesty and feminism. 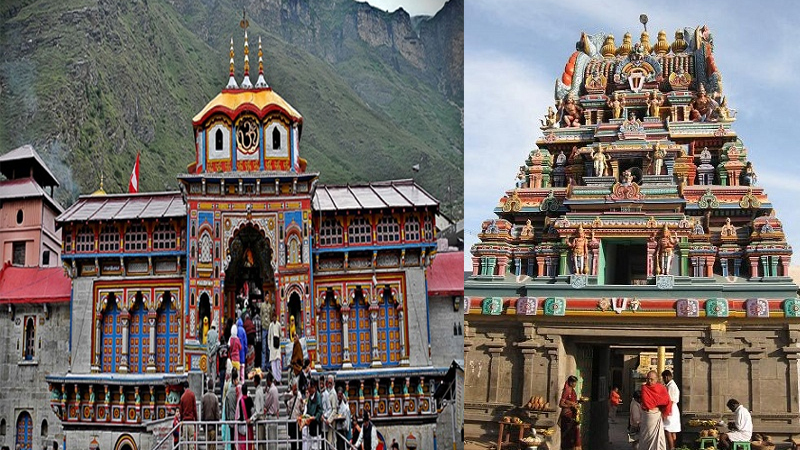 How can one not see the famous anrkali? This has been every girl’s desire to have an Anarkali kurta in her wardrobe. Especially a white Anarkali kurti will be in every girls list. 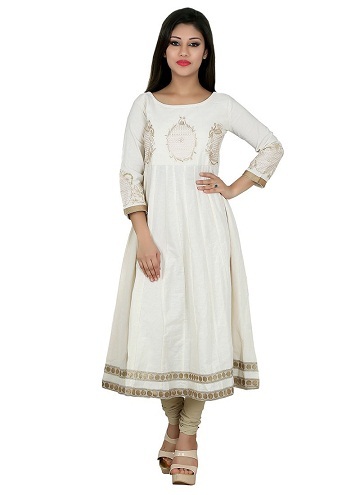 The white Anarkali kurti is such an outfit that completes even the most tomboyish girl in the room. No need to groom yourself if you have the Anarkali on. The Anarkalikurti is a pure symbol of the traditional avatar which is worn at special traditional events. Need a chic and young outfit for college? Then you got to try this outfit! Simple white kurti with a cool jacket is all that a young girl wants. You can wear this casually any time. Trying to twist traditional and smart look then try this out. These are perfect for the young generation to wear something smart and classy at the same time. Looking for a simple casual kurti? Then this is the one for you. A simple white cotton kurti will do the magic for you. This kurti is short in length and is very easy to carry. You can pair this up with jeans and jeggins as well. It is well suited for daily casual wear and best for college going girls. Growing up girls can surely wear these types of simple cotton kurtis to get into the traditional avatar. The most basic colour is white which is easy to mix up with and always gives you the best result. Here are some of the ideas about white kurties, how they can be worn and what the different styles are they have. There are various white kurti patterns, styles, designs, etc. that are out in markets. All these designs are in fashion and accepted by a lot of women. 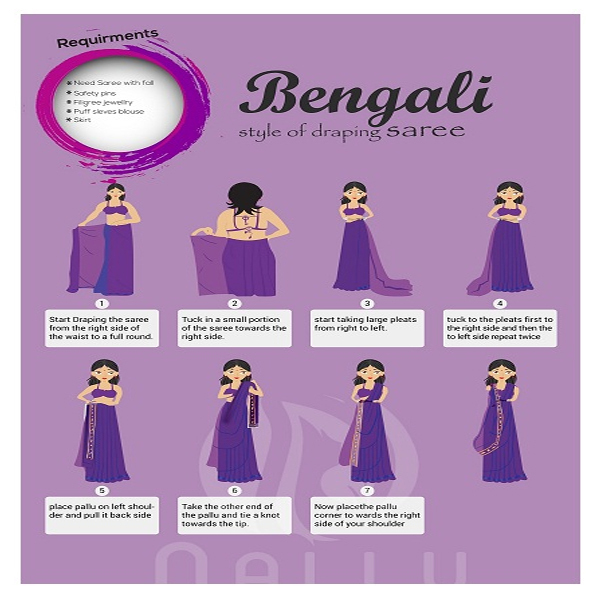 Feel free to try on some of these patterns see if it makes a difference in you be stunning with the classy Indian look.